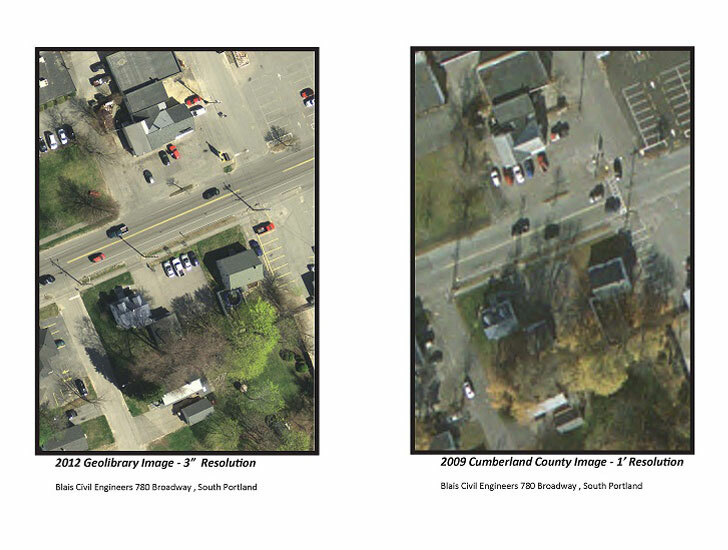 The Maine Office of GIS (MEGIS), which maintains public geospatial data such as maps and images of towns and coastlines, has recently announced a significant update to their imaging technology for York and Cumberland counties. MEGIS now offers color and color-infared orthoimagery, which combines the image qualities of aerial photography with the geometric qualities of a map. The resulting image is corrected for feature displacement and scale variation, and provides a high level of accurate detail. The difference is incredible, right? These new images are available in 24", 12", 6" and 3" resolutions in JPEG-2000-compressed tiles, OGC-compliant web mapping service (WMS) and KML files that are compatible with Google Earth. This means that high-quality, current images are now available in a variety of formats for Maine's most populated counties! Blais Civil Engineers uses MEGIS data to offer clients comprehensive analyses ranging from area drainage studies to downtown master plans. We're looking forward to incorporating these new images with the wide variety of other images and data available, to provide even more accurate and detailed service. Keep us in mind for your mapping needs or call us to talk about using this technology to bring a fresh approach to your next project.